The town of Nelson is definitely worth a visit during your time in New Zealand. Nestled at the top of the South Island, it’s a fantastic stopover on your way over to the wine country around Blenheim or the Marlborough Sounds. But Nelson isn’t just home to a great arts and crafts scene; it’s also a great entryway to the surrounding nature experiences in this area. One that you should absolutely check out is Rabbit Island. This fantastic recreational reserve has something for everyone and is a perfect addition to your time in Nelson. 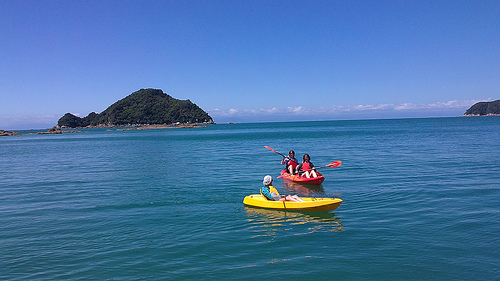 Rabbit Island is the largest of a group of islands in the Waimea Estuary is a 20-minute drive from Nelson, making it perfect for a half-day or full-day trip. There is also the option of taking the 10-minute Mapua Ferry. There are numerous options for activities here; walking, swimming, cycling, or else just relaxing on its beautiful beaches! This is the shimmering blue sea that greeted us during our visit. Time for a stroll along a 13km stretch of deserted beach! 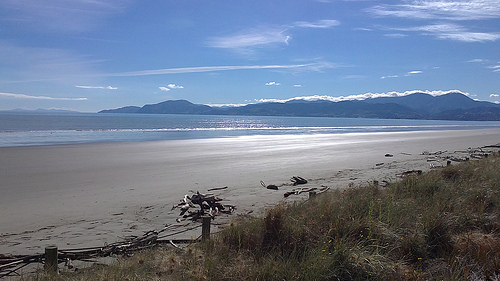 Most of our clients can’t believe their eyes when they see some of our beaches here in New Zealand. “Where are all the people?” they keep asking! But that’s exactly what makes New Zealand so unique compared with other destinations. Here, you’re never too far from a beach, a picnic and a nice dollop of isolation. That’s the beauty of a nation which is home to just under 5 million people and 15,000 miles of coastline! It’s very rare for you to have to worry about anyone getting in the way of your beach snaps. 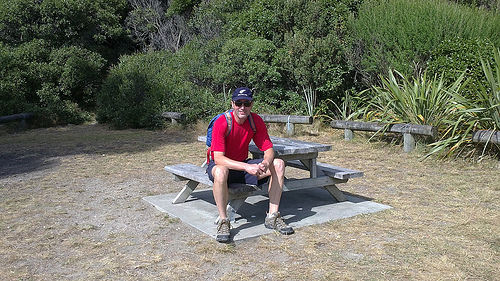 Rabbit Island is covered in pine plantations and is set up as a public reserve, which is fairly common throughout New Zealand. Although they are dedicated to forestry, a certain amount is usually open to public recreation as part of the deal. It’s an ideal picnic spot, as we discover after a few hours! Rabbit Island is kayaking country, and you will always find a few souls heading down to take advantage of the early morning calmness. 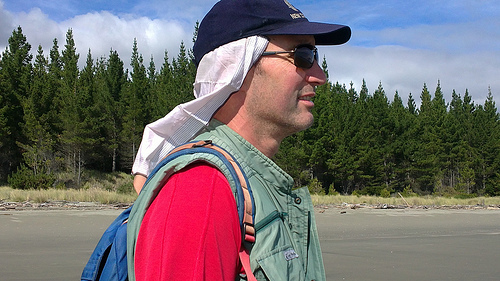 As a nation, New Zealand weather patterns tend to be pretty driven by the wind. The earlier you leave in the day, the stiller it tends to be, and therefore the most easy-going. If you get lucky, the water is like the surface of a mirror. Adventure always beckons in a place like this, and there are options out there for everybody. For us, the best part of visiting Rabbit Island is its cycling tracks. 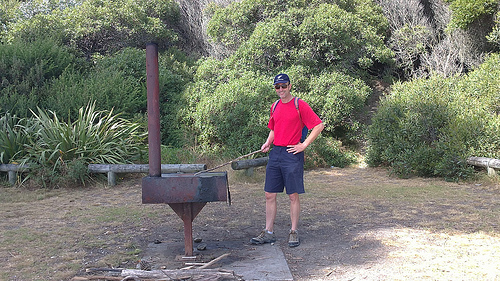 Since 2011, a 6.8km section of the Tasman Great Taste Trail now runs through Rabbit Island. Best of all, this is suitable for all ages and fitness levels. It’s heartening to see fit mums & dads with their kids, pedaling along these tracks. 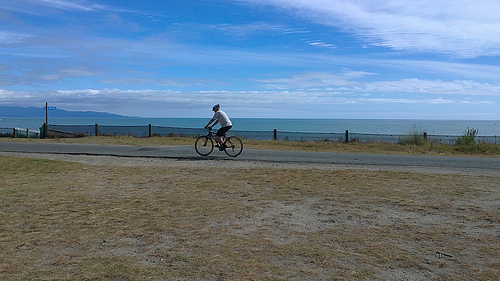 The cycle trail runs from the entrance to Rabbit Island through to the Mapua estuary. Note: It’s very important that you keep to the marked trails whilst visiting Rabbit Island. There is usually logging in progress, and this helps to ensure the safety of all visitors. 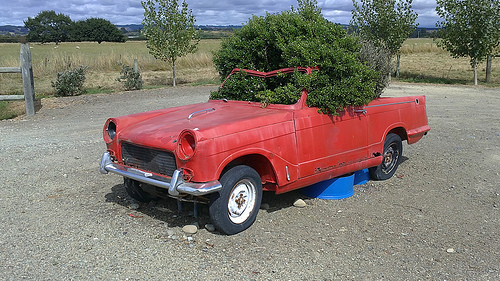 If you see this unique giant potplant on the way to Rabbit Island, you’re definitely heading in the right direction folks! Spending a day getting out in nature is a great way to spend any holiday, and Rabbit Island is a great option for any traveller, especially for those on family holidays. Being in such close reach of Nelson, it’s easy to fit this into your tour of the area. Enjoyed the post and pics immensely!